Bang! I am in complete and utter darkness. I can’t stop the flood of emotions from coming and I hear a baby start to wail. Is that me? I calm my fear by asking my angel guides to show me what I need to see. I repeat, “I surrender, I surrender, I surrender…”. The blackness dissipates and then I am in the desert, hot sun, calm, grounded. My angels show me a gigantic white oval pod that looks like a cocoon. They start to tear it apart, piece by piece. Then I find myself growing up, up and up above the tree-line. I look down and see myself as a tree. My legs are a tree trunk and I sense my feet as roots. Wow! This is so cool, I think to myself. My journey continues through realms of space, the ocean, the desert and back as a tree. Over and over again I travel. And then it’s finished. My “sitter” answers my question. It’s 3 hours later. I’ve done a lot of “out of the box” things in my life, so this experience wasn’t weird by any means. This was a Holotropic Breathwork Workshop. 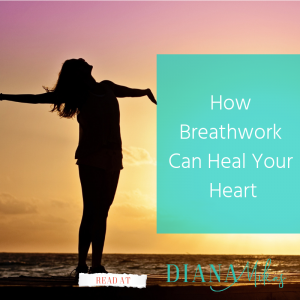 And I’ve come to see breath work as an important element in all of my practices. It’s not only essential to life but it’s been around for a millennium. From Ancient Yogic and Buddhist practices, Tai Chi, to all forms of Meditation, breath work is the link to guide us on our path to enlightenment and our evolution. Breathing is the first thing we do when we are born to the last thing we do when we die. It is the thread that keeps us in this realm of existence. We hold our breath when we are fearful and we breathe out as a sign of relief. We can exist for days without food or water but we die instantly if we stop breathing. It is essential to life. But what’s so phenomenal about breathing? Scientifically speaking, we need oxygen for our cells to function, for our blood to flow and our organs to work. Diaphramatic breathing in particular, has been shown to reduce cortisol levels, improve our cognitive ability, level off our emotions so we can cope with stress and anxiety, help us sleep better and ward off dementia . But more importantly, it helps us heal our heart by allowing our bodies to start producing happy neurotransmitters like serotonin, dopamine and oxytocin. One study suggests that breathing through the nose most significantly increases the electrical impulses in the brain necessary for cognitive ability, whereas breathing through the mouth does not. Max Strom, teaches how 10 – 20 minutes of breathwork can change your health significantly. Stanislav Grof, a Czech Psychiatrist, one of the founding fathers of “Transpersonal Psychology” (think Ram Das and Timothy Leary) was known for using LSD in his therapy sessions. Dr. Grof , invented Holotropic Breathwork (after the war on drugs happened in the ‘70’s). These are three of my favourite techniques that everyone should have in their arsenal of practices. Clearing Breath. According to the Dalai Lama, this technique will “clear away impulses toward lust or hatred” or “counter-productive currents of energy”. Whether you suffer from “lust or hatred” isn’t the point. This technique serves to clear the mind so I recommend you do it first thing in the morning. Start with your left hand, using your thumb and middle finger. Placing your thumb on your left nostril, breathe in deeply (allowing your diaphragm to expand), then release the left nostril and with your middle finger hold your right nostril and exhale. Do this 3 times. Then reverse by closing your right nostril with your middle finger and inhale through your left nostril. Place you thumb on your left nostril then exhale through your right nostril. Do this 3 times. When complete, lower your left hand onto your lap and take 3 breathes in both nostrils, remembering to fill your belly. Watch the clarity come. Fire Breath. This technique is a staple in many yogic practices. It is perfect to do in the middle of your day if you are feeling a bit tired and lethargic. It also helps to activate your 3rd chakra, which is your power centre. This technique is most helpful if you’re nervous about a presentation or have an interview. First, sitting cross-legged or Japanese style on your knees (my preference) or standing, close your eyes and focusing on your exhale only, use your diaphragm to sharply push your breath out of your nose. Do this as quickly as possible, 30 times in one set. Do 2 more sets. Go get it girl! Calming Breath. Becoming aware of your breathing and slowing it down is scientifically proved to reduce cortisol levels, support your immune system and increase your feel-good neurotransmitters. Start by taking in a deep diaphragmatic breath through your nose on the count of 4. Once full, hold that breath for the count of 4. Then slowly release on the count of 6. Do this 20 times. Watch the tension melt away. In this day and age, when we are challenged to be the best we can be; we can become smarter, stronger, sleep better, and be super calm, by doing the one thing that we were born to do… just BREATHE. – my favourite yoga practice – Sivananda Yoga. If you want a guided daily breath work meditation, simply start here: 5 Minute Breathing Meditation. « How To Tell If You’re Really Done?